Opinions differ widely on chocolate brownies: there are probably as many recipe variations as there are cooks. Should brownies be moist and squidgy? Or light and fluffy? Do you use chocolate or cocoa powder? Does a true chocolate brownie recipe include nuts? Or raisins? 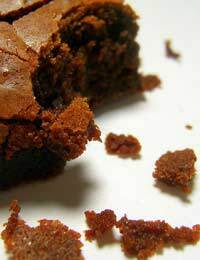 English cook, Hugh Fearnley-Whittingstall, even adds Guinness to his recipe for brownies! Try out one or two – or four! - of our recipes and see which way you prefer your brownies. The earliest known published recipe for brownies comes from the Boston Cooking-School Cookbook of 1896. Fannie Merritt Farmer’s recipe uses molasses instead of chocolate. Take one third of a cup butter. Mix in one third of a cup of icing sugar, one third of a cup of molasses and 1 egg. Beat well. Stir in seven eighths of a cup of plain flour and 1 cup of pecan nuts, roughly chopped. Spoon into small paper cake-cases, top each with half a pecan and bake. Preheat the oven to 180oC, gas mark 4. Grease and line a baking tin about 8 or 9” square. Sieve together the flour, baking powder, cocoa and salt. Beat the sugar and butter together until very soft and fluffy. This will take some time! Melt 7 oz chocolate in a bowl over a pan of simmering water. Don’t let the bottom of the bowl touch the water! Roughly chop the remaining 1 oz chocolate. Add the egg a little at a time to the creamed mixture, beating well between additions. Mix in the melted chocolate and chocolate pieces. Carefully fold in the flour mixture. Pour the mixture into the tin and bake for about 30 minutes. A skewer stuck in the centre should come out sticky, but if it still has raw mixture, cook a little longer. 12 oz plain chocolate – the best quality you can afford! Preheat the oven to 190oC, gas mark 5. Grease and line a baking tin about 9”x13”. Melt the butter and sugar together in a bowl over a pan of simmering water. Sieve the flour. Whisk the eggs and sugar and vanilla together for 10 minutes. Blend the melted chocolate mixture into the egg mixture. Fold in the flour and walnuts. Pour the mixture into the tin and bake for 25-30 minutes. The cake should seem slightly sticky but not raw in the middle when tested with a skewer. Preheat the oven to 180oC, gas mark 4. Grease and line an 8” square tin. Melt the butter in a pan over simmering water. Stir in the cocoa powder. Beat the eggs and caster sugar together until light and fluffy. Stir in the cocoa mix and the vanilla essence. Sieve in the flour. Add the nuts and raisins and mix well. Pour into the tin and bake for 30-35 minutes.